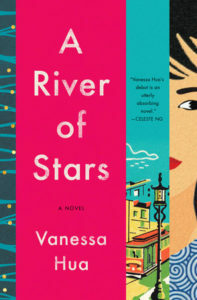 A River of Stars follows Chinese factory department head, Scarlett Chen, on her harrowing journey as an undocumented immigrant in San Francisco’s Chinatown. Scarlett falls for her married supervisor, and becomes pregnant during their affair. As the father of three daughters, Boss Yueng is delighted to find out Scarlett is having a boy, and to keep her safe from his family, he sends her to a secret home for pregnant Chinese women in Los Angeles. In reality, Perfume Bay maternity house is a barely floating ship in which Scarlett becomes a prisoner. In the middle of her isolation and poor living conditions, Scarlett finds out in a second ultrasound that she is carrying a baby girl, not the promised boy. She’s terrified of Boss Yeung’s reaction, and escapes Perfume Bay in the company van, soon after finding that Daisy, a teenager from the house, has stowed away with her, and together they make their way to San Francisco. They survive hand-to-mouth in the Chinatown ghetto, relying on the tenuous good-will of their neighbors as the ever-ticking countdown of their visitors’ visas weighs heavily on Scarlett’s mind. There’s no money to go back to China, no money to get a green card, and the threat of deportation looms greater with every passing day. Hua is an amazing writer, her prose tight and packed solid with emotion. She deftly handles several characters’ points-of-view, giving the book a well-rounded feel that never allows any character to become the enemy. These are people with difficult histories and tragic stories trying to eek out an existence in a tough world. Scarlett and Daisy’s desperation is a palpable and driving force through this story as they teeter on the brink of both financial and personal destruction due to a system and a culture that are against them. Hua takes readers to China and shows us the cold, hard truth of the factories, the fields, and forced abortion clinics. One of the most moving things about the story is her ability to show the culture in a way that is both normal to Scarlett and understandable to western readers without losing the emotion and tension of the story. It is timely and raw, giving an open and honest look at the fate of many undocumented immigrants stuck and sinking in their situation with no way out. Hua leaves the book on a positive note, showing that not all hope is lost, but the way in which the characters are saved still points to the tenuousness of Scarlett and Daisy’s existence based on the social constructs surrounding them. Only through someone else’s generosity are they able to escape poverty and deportation. There are no bootstraps for them, no way to dig in and pull themselves out. There is only luck, a salvation that comes not from the system, but from the good hearts of others.